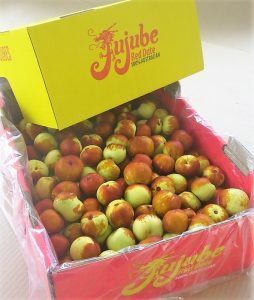 Fresh Jujube – SOLD OUT UNTIL 2020! Place your order by midnight Sunday to receive our farm fresh jujubes straight to your door! We pick, pack, chill and Express Post your delicious jujubes on Tuesday for expected arrival to you on Wednesday (capital cities). Your jujubes stay super fresh and crisp on their journey to you, safe and sound in an insulated box with an ice pack. 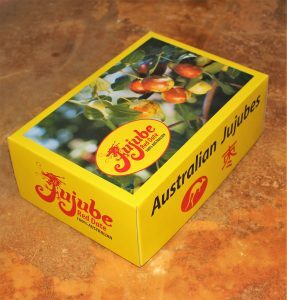 We have Chico jujubes available right now in two box sizes – a beautiful, glossy 1.5 kg box perfect for gifting to family and friends, and our regular 3 kg box. Select your size from the drop down menu below. Prices include FREE DELIVERY. Please note that we can only post FRESH jujubes to Vic, NSW, Qld, ACT and NT (not to SA, WA or Tas due to quarantine restrictions). 1. First, check whether your local fruiterer or grocer has them. 2. If they do not, ask them to get them from the wholesale market for you!